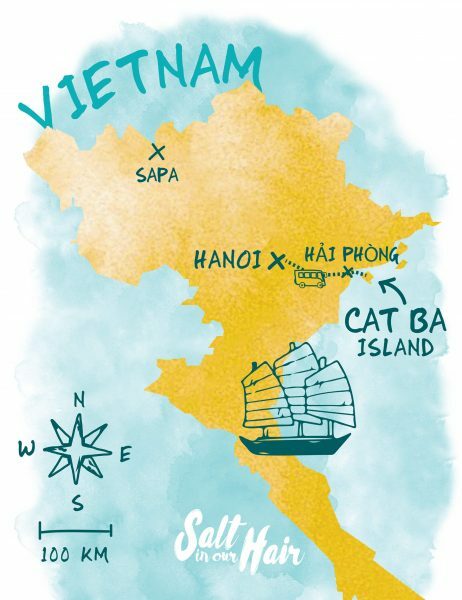 Cat Ba Island in Vietnam is the perfect place as a stopover for a Halong Bay tour. 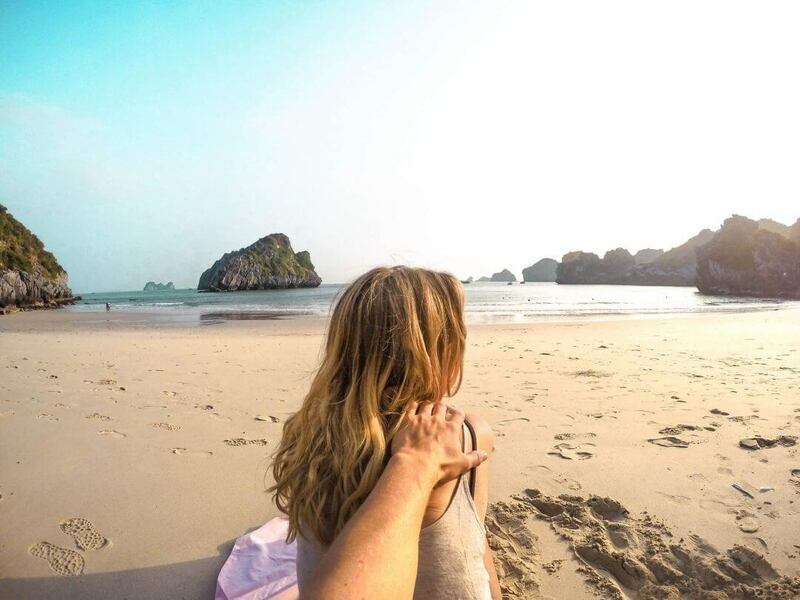 You will escape Hanoi and have the possibility to arrange a cheaper Halong bay tour. Cat Ba island is a chilled out place with a few small, though nice beaches, a rich history and there are some spots with a good nightlife, which are pretty cheap! During the wars, the island was a strategic look-out point. During the bombing, local residents hide among the island’s many caves. The cave hospital is one of the impressive leftovers. We’ve booked a day tour at Cat Ba Ventures ($25, lunch + water) which was a good company. 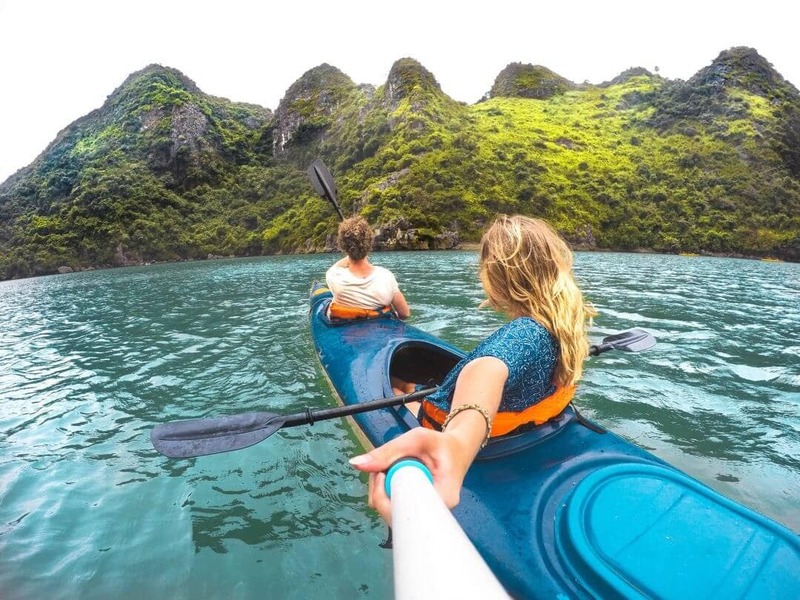 They will visit less touristy areas that are maybe even more beautiful than the famous part of Halong Bay. 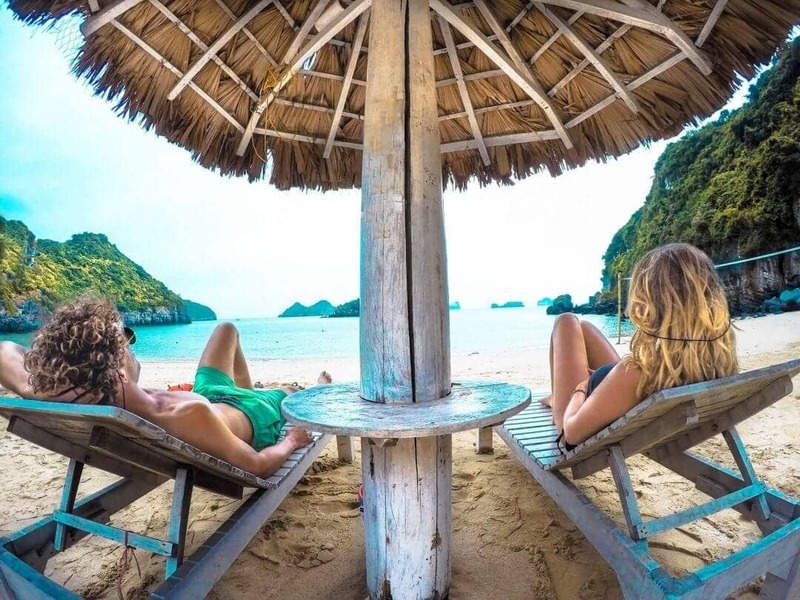 Around 8 AM you’ll take the boat from Cat Ba town through the floating villages, cruise through Lan Ha Bay and enjoy the hundreds of limestone islands. 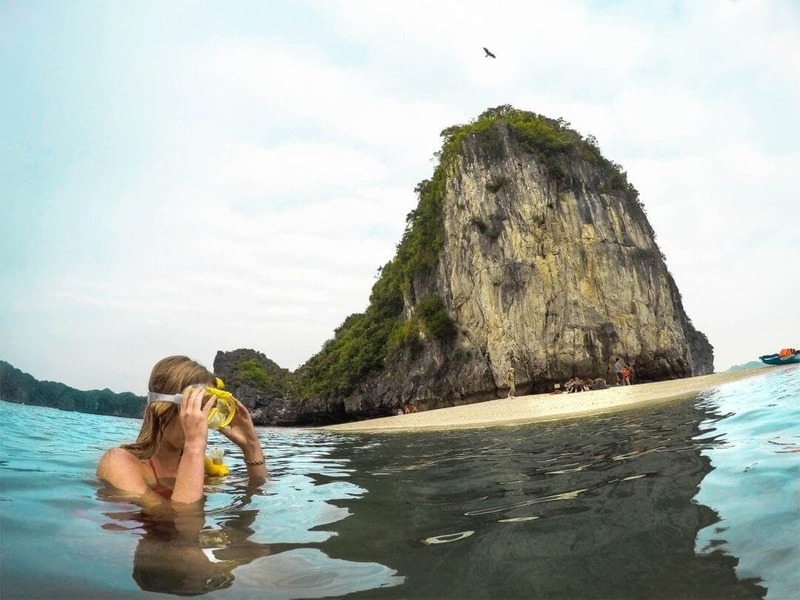 The Halong Bay tour includes snorkeling gear, dry bags, kayaking, a great lunch and swimming at a deserted beach, all entrance fees into Halong Bay and an English speaking local guide. Rent a scooter and explore the island. 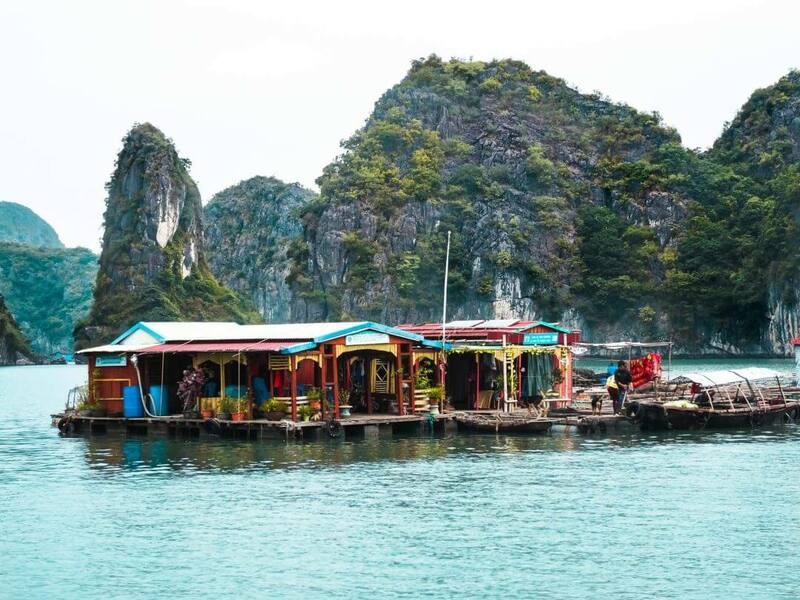 Visit Cat Ba Island to stay low on a budget to see Halong Bay. Make sure to get to Hanoi first! After Cat Ba, take the bus + boat + bus to the beautiful Tam Coc, Ninh Binh. From Hanoi, you will have to take the bus to Haiphong, which takes around 2.5-hour. From there, take the ferry to Cat Ba and the bus to Cat Ba town (1 hour). The ferry cost you 70K Dong (~ $3) for a one-way ticket. The boat timetable will change so now and then. Please check their website. Make sure to stay near the pier in Cat Ba Town, this is where the food and drinks are on Cat Ba. We’ve picked our two favorite places. We got you a $15 discount at Booking.com if you book via this link, you’re welcome! ? The name of this hostel is a bit misleading. Big rooms, AC, breakfast and not really a party hostel. Still a really good choice. In middle of the city centre for $10 a night. Homestay with a private beach, water sports facilities their own restaurant. Not on Cat Ba but an island nearby. Your own piece of paradise only for $55 a night.